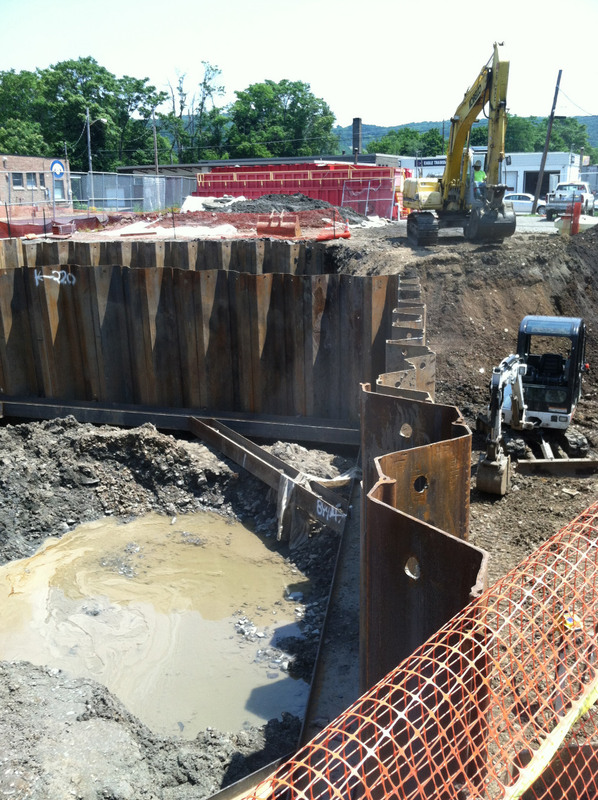 NRC performed remedial construction services at this former dry cleaners site in Elmira, New York. The goals of the remedial action work plan were to remove a hazardous and non-hazardous PCE contaminated soil. Injection wells and monitoring wells were installed in conjunction with the site restoration tasks. Site preparation included the installation of a site perimeter fence, erosion and sedimentation control structures, stockpile areas, a decontamination pad and dewatering equipment. The 8-inch former building slab was removed, resized and disposed of off-site. Shallow soils (0-10 feet) were pre-characterized in place for live load-out of most of the soil. NRC designed and installed a two cell excavation support system which included approximately 400 feet of over 25-foot long steel sheets and two levels of whalers to support the remedial excavation which progressed to over 30 feet in the deepest area. 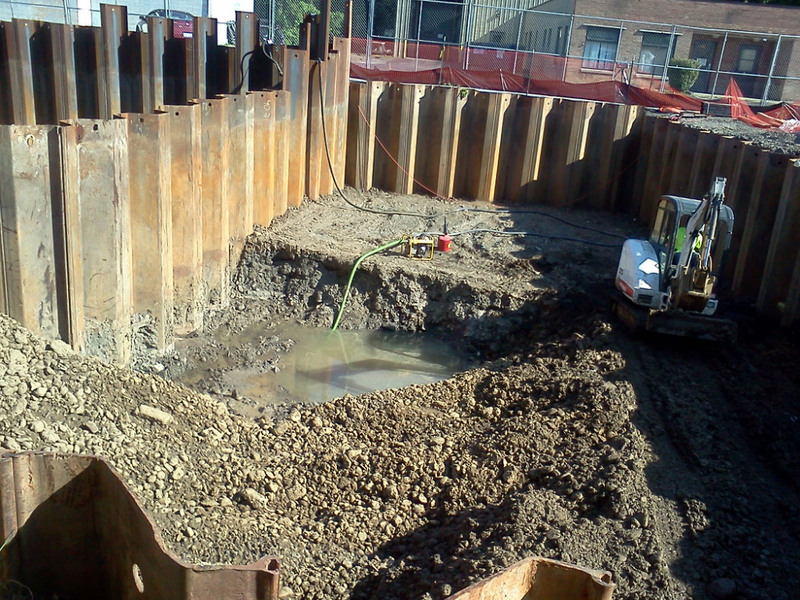 A well point dewatering system was installed and maintained throughout the project to maintain water levels below the target excavation depth. Air and vibration monitoring equipment were used for continuous recording of upwind and downwind activity to support the project’s Health and Safety Plan. Grossly contaminated PCE soil was removed with a combination of a 36,000-pound excavator, a mini excavator, a long reach excavator and a skid steer. The soil was stockpiled onsite where it was characterized for off-site disposal. In total, over 3,600 tons of non-hazardous soil was shipped to a local landfill and over 500 tons of hazardous soil was disposed of. Liquid Potassium Permanganate was injected via an array of PVC pipe into the excavation subsurface prior to backfill. 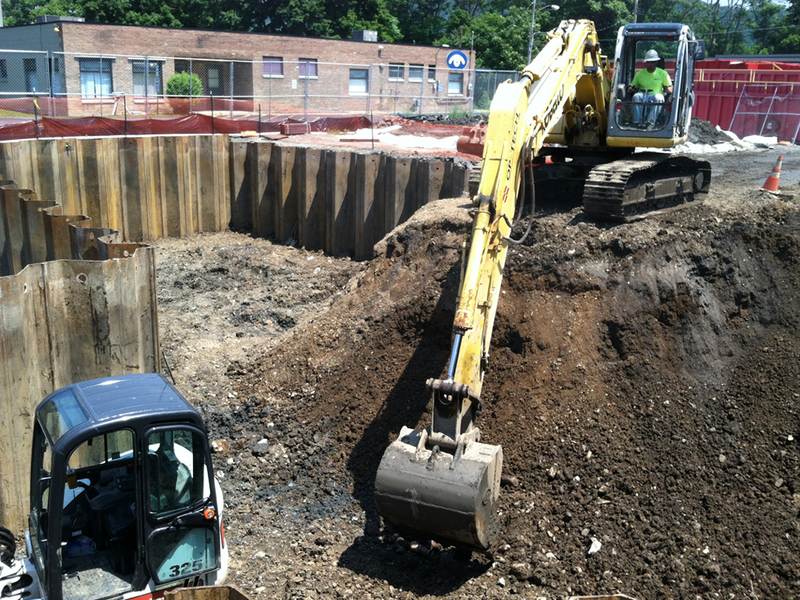 Clean, imported backfill was installed in the excavation area and compacted with an 84-inch vibratory roller. Design and installation of 2 cell excavation support system to support depths exceeding 30 feet. Installation and maintenance of well dewatering system. Air and vibration monitoring equipment for continuous recording. 3,600 tons of non-hazardous soil and 500 tons of hazardous soil.